The AKG K240 MKII are semi-open, circumaural headphones designed for audiophile use. They utilize patented Varimotion technology and extra-large transducers to deliver precise, detailed sound with solid low end, precise midrange, and clear highs. The headphones have a self-adjusting headband, as well as leatherette and velvet earpads for lasting comfort. A single-sided detachable cable is provided, along with a coiled cable, should that be your preference. The cables use gold-plated connectors for bolstered conductivity. Standard 3.5mm plugs provide wide compatibility, while an included 1/4" adapter allows you to connect to pro-level equipment. Box Dimensions (LxWxH) 9.3 x 8.8 x 4.35"
K240 MKII Professional Semi-Open Stereo Headphones is rated 4.4 out of 5 by 30. Rated 5 out of 5 by Josh from Quality sound, long lasting. Overall excellent! I bought these headphones back in April of 2014 from Sweetwater. After 3 years of use they're still going strong. I can happily say that I have had no issues with these what-so-ever. My favorite thing about these headphones is how comfortable they are. While I am not a musical professional, I spend every day at the PC working on programming and tech-art while listening to music and communicating with co-workers. They're lightweight and semi-open ear which allows me to feel almost as if I'm not wearing headphones at all. This allows me to remain aware of my work environment while enjoying high quality sound. Thanks AKG for creating a quality product. Rated 5 out of 5 by Anonymous from Light, comfortable and a dream to use I use the K240 headphones with my Alesis MultiMix8 mixer or directly plugged into a PC and a MacBook Pro when recording podcasts or voice over narrations. The other day I used them with my iPod and even though they looked huge in comparison, the sound was amazing. They are very light and comfortable to wear for hours. I can still hear the outside world enough for a conversation, but they isolate the sound very well. The MKII includes a coiled cord and a longer straight one. I use the coiled cord because it is compact and doesn't get in the way while I'm recording. This is a great set of headphones for a home studio or to listen to music. Rated 5 out of 5 by HughJorgan9 from These are cheaper EVERYWHERE else! I have been an AKG fan for over 40 years! I am on my THIRD pair in forty years! The first model I had was AKG 141 and after hearing the K240's I am forever spoiled by this pure sound these deliver. Rated 5 out of 5 by Anonymous from Fantastic I work in a room with several other people, and conversations are always going on around me. I use these headphones with my iPod so I can make the choice to join a conversation or not. Being the 'open-air' style headphone, I can listen to music and hear what is going on around me. And being large visible headphones, people tend to leave me alone. After the open-air quality, comfort is my highest priority, since I wear these all day. I have also the Mk I version of the K240s, and these Mk II headphones are more comfortable. I appreciate the choice between fabric and leather-like rings, and the coiled cord is nice. The headband is comfortable, the sound is very good - certainly good enough for an iPod. Rated 5 out of 5 by The Britisher from Great sounding studio headphone. These headphones deliver a really pleasing sound quality that only gets better the more you use them. The headphones fit very comfortably over my ears (I prefer the leatherette pads to the velour) and the headband design is flawless. With two cords, two sets of ear-pads, and a two year warranty, this is in my opinion a good investment for anyone looking for a sweet sounding, long lasting set of cans. Rated 5 out of 5 by Arri from Great Value -I use these headphones for listening to music, mixing audio, video editing, and gaming. 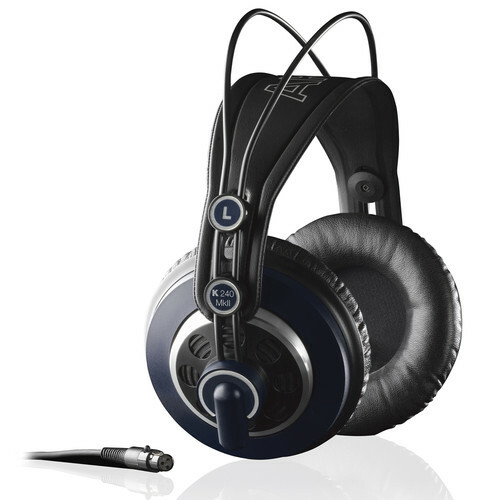 -I was looking for headphones that would remain comfortable for long hours (8+) and the MKII 's do the job. I forget they are on my head and leave them on even when I'm not listening to anything. They self adjust and stay on your head. -The sound quality is great - accurate and balanced. They sound much better after a months use. Those looking for powerful Bass response should test these out before buying. -They look and feel well built, and I predict I'll be using them for a couple of years. -Excellent design in respect to the replaceable mini-xlr cable and ear pads, plus, they come with replacements for both in the box. They deliver far more value then other headphones in this price point. Rated 5 out of 5 by Anonymous from Excellent value and good sound Good headphones for audiophile listening and for mixing as well. Good midrange detail. Although it's treble could be better is actually very convenient for long mixing sessions. A somewhat exagerated bass response, although it does well to compensate headphones inherent lack of low end. Great for drum listening! I also have a pair of dt-770s and i prefer the akg.